If you’re handing out treats, be sure to put your porch light on so trick or treaters know where to stop. For parents taking their kids around, skip the houses without porch lights on. They’ve run out of candy, are out trick or treating themselves, don’t celebrate or just don’t want to participate for one reason or another. 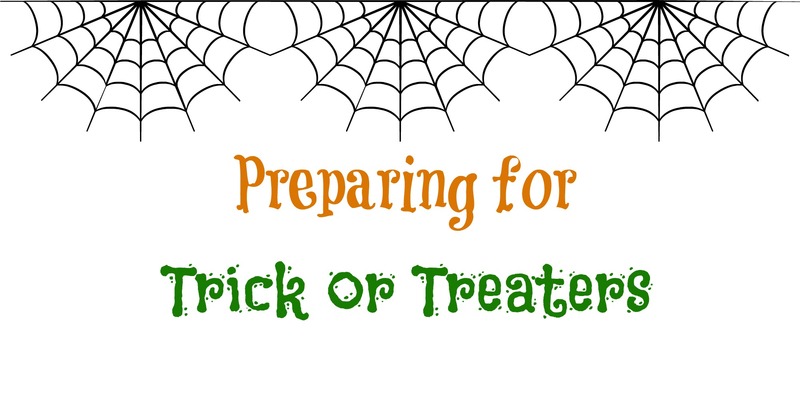 Have a plan for how the kiddos are going to get to wherever you’re handing out treats. Be sure the area is clear and as flat as possible to make sure no one trips in their costume and gets hurt. Any toys you might have out should probably be put up for the night (they’re a big temptation for the trick or treaters and your kids will be sad if something is accidentally broken). Jack-o-lanterns are super cool decorations. When you light them with real candles, be sure they’ll not on the path where your guests will walk. Most costumes are highly flammable and pumpkins can be knocked over very easily on accident. This can mean a couple of different things. For homes with pets, consider putting them in a safe place for the evening so they’re not scared or worked up with the door bell ringing all night, seeing strange people at the door, or trying to get out to play. Not everyone is a pet lover and some of the visitors will even be allergic so they’ll appreciate your efforts in making things more comfortable for everyone. Around our house, because we live in different neighborhoods and it’s still warm, many people will bring their dogs out to walk around with them for the evening. You’ll score bonus points if you’ve got some dog biscuits on hand for them too. We live in a fairly small town (big enough to not know everyone but small enough for everyone to know your business before you do) so requests can be just about anything from a new bag for candy to using the bathroom. I try to be prepared for just about anything and usually put a small basket on the porch with things like hand sanitizer, extra bags, bug spray and even water bottles for the parents. What do you do to prep for your trick or treaters?